so in an effort to drum up some more traffic for my etsy store, i have decided to have a giveaway. i would like you to look through the items i have and have sold and tell me what else you would like to see or colours you would like to see it in. i will give you until the monday after my wedding (eeek! ), thats monday the 7th, and the winner can choose any item in any colour they like. I love the Blythe red slouchy hat!! Your slouchy hats are really cute!! 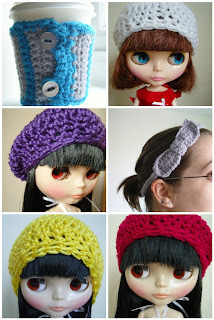 The Blythe hats are adorable! love the Blythe hat, maybe should add more colours? probably brown or beige. Your Beret is cute. Maybe one in black or chocolate? A cute idea could be to add something to the hats, like a small bow. the adult beret pattern is cute, and it's reasonably priced, but you could maybe offer other colors? oh my gosh, as in MONDAY! congratulations! !